The adaptor unit provides the mechanical interface for mounting various instruments including EFOSC2 on to the telescope. The unit also hosts the Guide Camera and calibration units. The NTT has two rotators, one on each Nasmyth focus. For an Alt-Az telescope such as the NTT, the rotator must continuously move to keep the instrument with the same alignment on sky. The rotator can move between -270 and 270 degrees (although the operating range is a little less than these physical limits), giving a range near 180 degrees that can be reached from two directions. 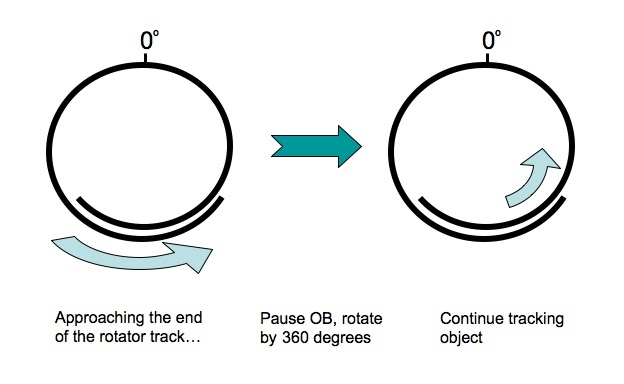 When tracking an object and passing through 180 degrees (ie approaching the end of the rotator range), the observer can pause (between exposures) and rotate through 360 degrees, giving the same orientation on sky but with the tracking then taking the rotator away from the limits, as shown in the diagram below. The telescope operator will take care of this, but the astronomer does need to warn the operator when taking particularly long sequences so one does not come up against the end of the rotator track unexpectedly. Changing the relative orientation of the sky and the CCD is an important function of the adaptor; this is achieved by rotating the adaptor by a fixed offset before continuing to track to keep that orientation. Position Angle : The angle measured North through East of (e.g.) the slit on sky, in the range 0 - 180 degrees, where a North-South slit has P.A.=0. Rotator Angle : This is the actual angle of the adaptor (also called the adaptor angle). The rotator angle at the beginning and end of each exposure is stored in the .fits header with keywords "HIERARCH ESO ADA ABSROT START" and "HIERARCH ESO ADA ABSROT END"
The Rotator Offset Angle specifies the angle that the rotator (and therefore instrument) rotate; objects in the field will appear to rotate in the opposite direction. Positive Rotator Offset Angles mean a clockwise rotation of the instrument, and therefore stars appear to rotate anti-clockwise on the real-time display. Negative angles move the instrument anti-clockwise, and stars clockwise. Starting with the default rotator orientation and letting an automatic procedure determine the correct offset angle - either parallactic angle (setting the offset angle = -9999 in P2PP will cause the Move_To_Slit acquisition template to calculate and use the correct angle) for single objects or along the line joining 2 targets (use Rotate_To_Slit acquisition template). The probability of wrong input values (input by the observer) varies from "not insignificant" to "very probable" depending on the time of the night, mode of calculation (calculator versus computer programme), degree of preparation, etc. It may save time for Rotate_To_Slit acquisition templates as large rotations are not executed very accurately and so starting the acquisition process close to the desired adaptor position "may" (not always) reduce the number of acquisition images by 1.